In recent years, transport trailer axle beams have become one of A.R.D. 's largest volume products, for which the company has a capacity of 5000 beams per month. A.R.D. Industries uses "World Class" qualified tubing and spindle suppliers that also supply integrated manufacturers of fully dressed axles and axle suspension systems. All tubing is hardened and tempered to a minimum yield strength of 90 ksi, for optimum strength/weight ratios. A.R.D. 's receiving inspection ensures material quality and conformance to specification. Inspect bearing T.I.R.- Concentricity 100% and straighten beams. A.R.D. Industries will manufacture the highest quality Axle Beam and deliver anywhere in the world in a timely manner. A.R.D. 's current capability is for producing conventional straight bare axle beams for integration into a dressed axle and/or suspension system. A.R.D. Industries is in negotiation to establish firm future volumes for our own production of drop-center bare axle beams, including a simplified, less costly production sequence. The D22 tapered spindle is a high strength, hot forged spindle with both large and small bearing journals induction hardened. It is accepted and most widely used in the North American market. The D22-M tapered spindle is a high stength, hot forged spindle with both large and small bearing journals induction hardened. It was developed for the European and overseas markets with a metric thread. The P22 (Propar) parallel spindle is a high strength, hot forged spindle with the large bearing journal induction hardened. This axle is recognized world wide and is used throughout North America, South America, Europe and Africa. Friction welding has long been recognized as a cost effective method of producing high integrity piston rod assemblies. A.R.D. 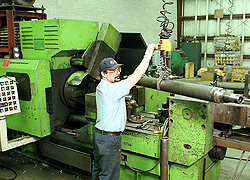 Industries currently produces various piston rod assemblies for many different customers and applications. 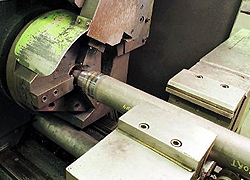 Friction welding is also used for cylinder body fabrication such as joining of gland rings to tubes and with orientation or radial friction welding to align ports and also weld end caps to tubes. The most economical trunnion design will consist of a low carbon steel bar (C1018) sawcut to size with a milled flat. The trunnion is friction welded to a finished machined (C1045) chromed rod. Another common design will consist of a cast steel clevis friction welded to a finished machined (C1045) chromed rod. A superior design (with the greatest fatigue strength) would be a cast or forged clevis or eye with an integral rod "stub" friction welded to a finished machined (C1045) chromed rod of equal diameter. 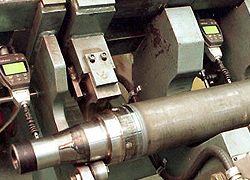 Depending on the the application, the flash roll may be left in place or removed by a hot scarfing operation on the friction welder as required. 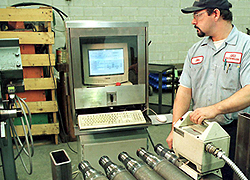 The only subsequent operation is cross-boring and cross-drilling grease zirk hole. No post weld heat treatment is necessary. Expected Trunnion or Clevis or Eye concentricity is .025 to .040" max. T.I.R. with a total length variation up to +/- .030". A.R.D. Industries can offer an economical friction welded alternative for all your piston rod assemblies with closely controlled and repeatable results. We can supply sub-contract friction welding services only, or provide a complete finished piston rod assembly. A.R.D. 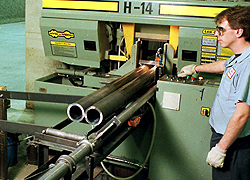 Industries has been friction welding drill rods for over 20 years. 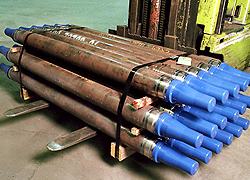 Drill rods are an important part of A.R.D. 's success and is one of our most reliable products. We produce drill rods for many different customers and applications which are distributed worldwide. A.R.D. Industries has worked with many different customers and developed new products. We can provide prototypes and design input of new designs and configurations for customer approval and testing. Threaded drill rods are commonly used for surface and underground drilling such as rock drilling, rotary drilling, directional drilling, core drilling or percussive drilling. The rod section is either round or hexagonal. The width of hexagonal rods (across the flats) is equivalent to the diameter of the corresponding size of round rod as shown below. The hexagonal rods having a larger cross sectional area are stronger and more rigid than round rods of the same diameter. Size ranges: 1.25" - 2.00" Round, but not limited to this range. Guide or stabilizer rods are only available in male-female (M/F) thread configuration. They incorporate two guiding sections to improve hole straightness when drilling. Size ranges: Varies per individual customer requirements. Drill tubes are used in the drilling of large diameter holes or when conventional drill rods give insufficient flushing. Size ranges: 1.75" - 5.25" Round, but is not limited to this range. A.R.D. Industries also produces bi-metal (Cu/Al) electrical connectors which are used to terminate underground power transmission cables. Copper/Aluminum transition pieces are used when copper has been replaced by aluminum for transmission cables. Conductivity is adversely affected by the susceptability of bi-metal corrosion and oxidization. As a result, the need for transmission pieces which are capable of joining aluminum conductors and copper conductors in existing electrical equipment are required without having to redesign existing equipment. Pump shafts involving joints between plain carbon and corrosion resistant alloy steel is also a common application friction welded at A.R.D. Industries. Most commonly the carbon steel part of the shaft may be the shaft on the electric motor and the corrosion resistant alloy part of the shaft is used in a corrosive enviroment. Stainless steel to low carbon steel are most commonly used over more expensive corrosion resistant material. The automotive industry is an active market in which friction welding is commonly used. The majority of automotive applications are welded on machines ranging from 6-45 tons forge capacity. Many of these machines may be automated with loading and unloading done by robotics and dedicated material handling. A.R.D. Industries is a tier 2 and 3 supplier to many different OEM customers and are currently producing parts for General Motors and Meritor Automotive. A.R.D. Industries has the capability of providing full traceability of each part produced. Friction weld data can be stored and archived and with the use of individual serial numbering or lot traceability through julian date stamping in order to meet customer requirements.